Stunning digital photographs feature 120 common and notable Neotropical specialties, enabling users to easily identify most birds they encounter — day or night — in Puerto Vallarta, including Cabo Corrientes (El Tuito, Rancho Primavera, Mayto, Yelapa, Boca de Tomatlan, and Vallarta Botanical Gardens, etc. ), Nuevo Vallarta (including Laguna Del Quelele), Valle Rio Ameca, Bahia de Banderas (including Islas Marietas Marine Sanctuary), Punta Mita, Sayulita, and points between. 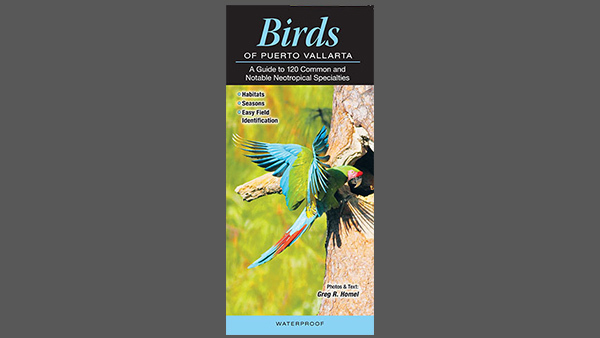 Aimed at beginning, intermediate, and international birders, the guide takes into consideration that most users will concentrate on identifying the colorful Neotropical Mexican specialties they encounter in the region, so it includes mostly these birds. It takes this focus a step further by acknowledging the fact that birding is growing in popularity among Mexican nationals as well, so the nomenclature reflects this by including English, Spanish, and Latin names for each included species. As a special bonus, the guide does double duty as a birding site guide by the inclusion of a key that indicates the best locations to find the included specialties.